Whale Crag is located 2km west of Anti-Crow Hut, on the true-right of the Waimak, below point 951. The crag offers nice slab and shallow crack climbing with low grades. The setting is very beautiful and it escapes some Divide weather. The lower routes are surprisingly sheltered from the wind. 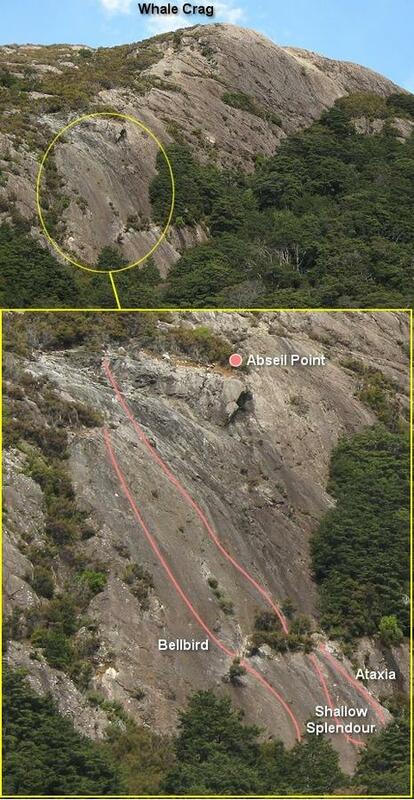 Access is very straightforward; descent off all current routes is by abseil (50m). Start on the bushy lump 10m left of Shallow Splendour. Climb a few crumbly metres to the left trending crack, follow this up to ledge and belay. Climb left up good looking crack through steep section and easily out to bush belay. Start on left side of main base area. Up and 2m across sloping ledge. Straight up cleaned cracks to belay off bushy ledge. Climb in almost any direction from bushy ledge to the top. Start up and right of Shallow Splendour, follow right hand side through bulge and up to top. I strongly suspect that this crag is NOT on the true right of the Anticrow River and is actually situated below spot height 951m, 2km west of the Anticrow hut and 600m west of the Anticrow river.